More than 200 years ago, ETA Hoffman wrote The Nutcracker and the Mouse King. Because I’m not that old, I don’t know what reception the story earned, but I do know that the property’s lasting appeal comes from Tchaikovsky’s ballet adaptation, itself a take on Alexandre Dumas’s 1844 update on Hoffman’s text. I guess that makes 2018’s The Nutcracker and the Four Realms a reworking of an adaptation of an update. Whatever the case, the story takes us to 19th century London on Christmas Eve, where we meet young Clara Stahlbaum (Mackenzie Foy). Clara receives a locked egg bequeathed by her deceased mother Marie (Anna Madeley) and she struggles to open it. As she seeks the key, Clara winds up in an alternate world where she pairs with soldier Captain Philip Hoffman (Jayden Fowora-Knight) to locate the object, return Clara home and restore order to various chaotic situations. Christmas-related movies often seem like such a license to print money that I don’t know why studios fail to make more of them. The reception accorded to Nutcracker might offer a hint, as it seriously underperformed financially. According to the listing on Box Office Mojo, Nutcracker stands as the 22nd highest-grossing Christmas movie of all-time, and that sounds pretty good. However, the list fails to adjust for inflation, and it also ignores profitability. Nutcracker nearly ties with 2015’s Office Christmas Party, a film that didn’t exactly bring in flocks of viewers. At least Party only cost $45 million, though, so with $114 worldwide, it likely made money. On the other hand, Nutcracker came with a $120 million budget. Given that it grossed $173 million worldwide, it clearly failed to turn a profit. Expect me to shed no tears over its fate. On paper, Nutcracker looks like a property that could delight, but the end result feels banal and wholly free from magic. The issues start in the first act, as the film opens with a sluggish setup. While it launches in a way that introduces the characters and situations, it feels slow and tedious. This opening to Nutcracker doesn’t use all that much screentime, but it fails to intrigue us. We get the basics without any real reason to engage in the characters or circumstances. Matters fail to improve appreciably when Clara enters the Realms. The movie desperately attempts to throw out various moments of enchantment and whimsy, but these all feel contrived and without any real sense of charm. These factors tend to make Nutcracker feel like a movie developed by a production designer. With lavish sets, the film creates a vivid visual world, but the different components never serve to support an interesting story. In terms of its plot, Nutcracker tends to seem derivative. It comes with a clear Alice in Wonderland influence and it struggles to find its own way. Whatever source brings us the story, not much about Nutcracker engages. As noted, Clara remains a pretty bland lead character, and I can’t say Foy brings much to the role. In terms of emotional range, Foy tends to look annoyed and not much else. She also fails to develop a consistent British accent, and her vocalizations become a bit of a distraction. 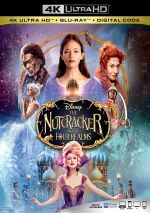 Boredom remains the biggest problem with Nutcracker, though, as the slow, tedious narrative never manages to go anywhere especially compelling. The movie’s visual sensibility adds some appeal but not nearly enough to sustain the viewer across 99 minutes. The Nutcracker and the Four Realms appears in an aspect ratio of approximately 1.85:1 on this 4K UHD Disc. Overall, the image satisfied. Sharpness worked very well, with virtually no softness on display. Instead, the image offered nice delineation and accuracy, even in wider shots. I saw no signs of jaggies or moiré effects, and edge haloes failed to appear. Print flaws also remained absent. With its fantasy setting, I hoped for a broad, bold palette from Nutcracker. This didn’t happen, as I found a largely orange and teal affair. While the disc replicated those tones as intended, they didn’t seem like a logical fit for the story. At least the reds used for soldiers’ costumes added some pep, and the disc’s HDR abilities gave us nice oomph to the tones. Blacks showed nice depth, and shadows were fine, as they displayed appropriate clarity. This ended up as a pleasing presentation. As for the movie’s Dolby Atmos soundtrack, it made pretty good use of the soundscape, especially in the film’s various action/fantasy moments. Downconverted to Dolby True HD 7.1, those placed material around the room in a logical manner and blended the material in a smooth way. Music showed good stereo presence and spread to the surrounds naturally. Environmental material felt logical and well-located. Audio quality matched expectations. Music appeared lush and full, with good clarity and range. Dialogue came across as concise and distinctive, while effects appeared accurate and bold. Those components boasted deep low-end. This became a more than satisfactory mix. How did the 4K UHD compare to the Blu-ray version? The 4K’s Atmos mix seemed a bit broader and more engaging than the Blu-ray’s DTS-HD MA 7.1 version, whereas visuals brought superior accuracy, colors and blacks. The 4K gave us the expected improvements. The set’s extras appear on the included Blu-ray copy, and we open with On Pointe. In this four-minute, 36-second piece, dancer Misty Copeland discusses her participation in the film. Choreographer Liam Scarlett, actor Mackenzie Foy and dancer Sergei Polunin also appear. Copeland gives us a few decent observations, mainly in terms of what it’s like to go from the ballet stage to the movie set. Not a lot of substance appears, but the featurette works reasonably well. Unwrapping The Nutcracker and the Four Realms runs seven minutes, eight seconds and features Foy, Copeland, production designer Guy Hendrix Dyas, set decorator Lisa Chugg, costume designer Jenny Beavan, and actors Helen Mirren and Keira Knightley. “Unwrapping” concentrates on the movie’s sets, costumes and production design. It becomes a frothy but informative reel. Five Deleted Scenes fill a total of four minutes, five seconds. As one can infer from that running time, these tend toward minor tidbits. They expand a few situations and characters in a modest way but don’t offer much of value. 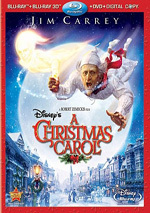 We also get music videos for Andrea Bocelli’s “Fall on Me” and Lang Lang’s “The Nutcracker Suite”. Both videos concentrate on movie footage, though “Suite” adds some special dance material. Neither video seems especially interesting. The Blu-ray opens with an ad for Dumbo (2019). No trailer for Nutcracker appears here. An attempt at a new holiday classic, The Nutcracker and the Four Realms falls flat. While often lovely to look at, the movie never develops engaging characters or a compelling story. The 4K UHD brings very good picture and audio along with a minor complement of supplements. Nutcracker never becomes anything interesting.